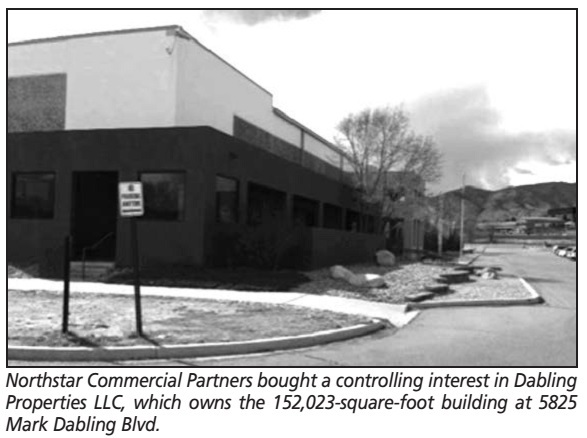 Northstar Commercial Partners recently invested in a 152,023-square-foot building in Colorado Springs, where occupancy rocketed from 28.57 percent at contract negotiation to 73.03 percent at closing. Northstar, which specializes in acquiring opportunistic commercial real estate assets throughout the United States, bought a controlling interest in Dabling Properties LLC, which owns the facility, PeakView at Dabling, at 5825 Mark Dabling Blvd. “We’re extremely excited for this opportunity,” said R. Brian Watson, founder and president of Northstar Commercial. “We are thrilled to be a part of this important building in Colorado Springs that with new tenancy will bring a significant number of new jobs to the community.” The call center/office/flex/ data center space, best known as the former home to Mr. Biggs Family Fun Center, which closed in 2012, currently is undergoing build-out for the two new tenants signed prior to closing as well as overall improvements to the building, including a new roof, HVAC, refurbishing the interior, exterior paint and landscape improvements. D1 Sports Training inked an 18,000-sf lease at the building, where it is expected to open this summer. The location, along with a D1 facility in Denver, marks the sports training company’s first foray into the Colorado market. Susan Beitle and Russell Stroud of Quantum Commercial Group represented D1 in the lease. The Macalan Group signed an 18,905-sf lease at the building, where it also is anticipated to move in this summer. Andrew Oyler of Quantum represented Macalan. Sam Cameron of Cameron Butcher represented Dabling Properties in both leases. Stellar Restaurant Solutions, a restaurant call center, which occupies nearly 60,000 sf at PeakView, is headed by partners who have owned the building for nearly nine years. The leases leave a 35,000-sf block of space, which can be demised to 10,000 sf, and is ideally suited for call center use, noted Watson. If needed, the owners could amass up to 57,000 sf by combining the 35,000 sf with some space from an adjoining tenant. “It would be phenomenal call center space,” he added, noting that with Stellar Restaurant Solutions already there, the technical infrastructure already is in place but the space also works for general office, flex and research-and-development use. Situated on nearly 15 acres, PeakView at Dabling has a parking ratio of 8:1,000. “It is one of the best parking ratios, frankly, in Colorado. It is very functional, flexible space,” said Watson. The owners already have seen tremendous demand for the balance of the space, primarily from call centers, both existing and new to the Colorado Springs market. “It’s very exciting,” added Watson. When fully leased, the building is anticipated to house 1,400 employees. Asking rates are $10.50 per sf triple net with estimated operating expenses of $3.50 per sf. Built in 1979, the building includes two drive-in and five dock-high doors, upgraded power, a backup generator and clear ceiling heights of 24 feet. Northstar also is working on the acquisition of a 13-property portfolio and other investment opportunities around Colorado. T5 Data Centers recently announced it has started construction on T5@Colorado, its sixth data center complex. The $800 million data center campus will be situated on 64 acres at Janitell Road and Executive Circle in Colorado Springs and the first phase of the project is expected to be complete in the first quarter of 2014. T5@Colorado is a purpose-built data center park and features sustainable, ecofriendly design that takes advantage of the High Plains climate by using cooler, drier external air to reduce air-conditioning and operating costs. It is expected the campus will create 400 to 600 new jobs in the area. “Colorado Springs is the ideal location for the next phase of our expansion,” Peter Marin, president and CEO of T5 Data Centers, said in a release. “This is a vibrant, growing area with a strong and supportive business climate, and the proximity to Denver, as well as local colleges and military installations, gives us terrific talent and local resources. We want this new data center campus to be groundbreaking as an ecofriendly green facility, offering our customers the best possible enterprise infrastructure and support services at competitive rates.” T5 provides state-of-the-art, customizable computing support environments. A 14,400-square-foot industrial building at 3345 N. Cascade Ave. in Colorado Springs recently sold for $762,500. Paul Engel of NAI Highland LLC represented the buyer, Shaw Pump & Supply Inc. The seller was 3345 N Cascade LLC and was represented in the deal by Bob Garner and Jim Spittler, also of NAI Highland Reconstruction Experts Inc. recently inked a 5,000-sf lease at the Corporate Centre Business Park II. The reconstruction company leased the space at 6265 Corporate Drive in Colorado Springs from landlord Columbus Real Estate Investments. The tenant chose the property, as it not only offered more space but also a better, more visible location. Randy Dowis and Bob Garner of NAI Highland LLC represented the landlord. Olive Real Estate Inc.’s Stan Kensinger represented the tenant Cascade Commercial Group recently handled several leases at The Sinton Pond Office Building at 3630 Sinton Road in Colorado Springs. Legacy Title leased 5,509 sf while Colorado Networks occupies 1,506 sf. Cascade represented building owner 3630 Sinton Road LLC on both transactions. Andy Oyler of Quantum Commercial Group Inc. represented Legacy Title. Charlie Martin of CT Martin LLC represented Colorado Networks. With the leases, the building is now 100 percent occupied.